If you can point, click, drag and drop, you can create a website. Today we bring you another drag-and-drop website builder for creating websites in a fast, code-free way – 90 Second Website Builder. This downloadable application has a look and feel of BlueVoda whose interface is very similar to Microsoft apps such as MS Word. However, while BlueVoda users can host their sites only at VodaHost, 90 Second Website Builder customers are free to use any provider. 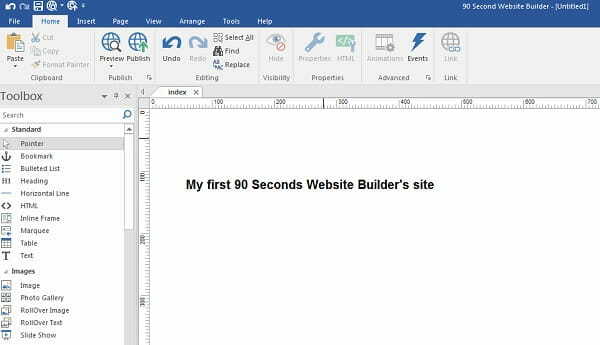 To start building your website you need to download and install the 90 Second Website Builder software onto your computer. You can start with a free 30-day trial version. The process is painless and requires no credit card information. The builder itself is pretty similar to MS Word, but with more functionality. It supports drag-and-drop editing. animation and transition effects (CSS3) and more. All in all, it offers enough tools to design a simple website that requires no custom coding. There’s no limit to the number of websites/pages you can build. 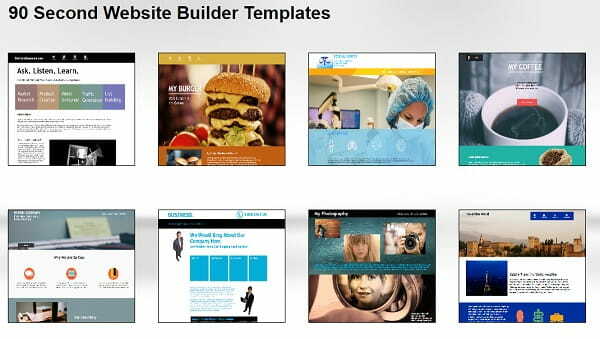 The builder has over 200 starter templates. These are fully customizable: you can move things around, delete what you don’t need, add things you like, change the background etc. The templates are somewhat outdated. It seems as though the builder stopped updating the library a few years ago. So if you want something really beautiful, your smartest decision will be to start with a blank canvas, thankfully this option is also available. Users can also create mobile-friendly versions of their desktop sites with the same drag-and-drop ease using the The Mobile Theme Editor. 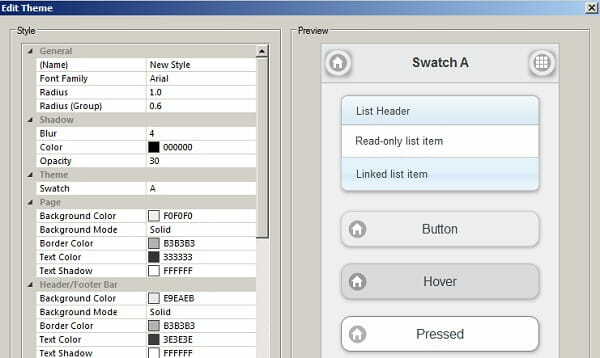 The Editor includes pre-built mobile templates and over 1600 smartphone style graphics. Please note: we’re not talking about responsive design. First, there’s a huge collection of video tutorials. These are very helpful and to the point. If you decide to use 90 Second Website Builder to build you site, I highly recommend that you watch their tutorials before adding this or that feature. By doing so you’ll save lots of time. You can also refer to the User’s Manual, send a support ticket or contact one of the experts over phone. You can download this website builder and use it for free during a 30-day trial. 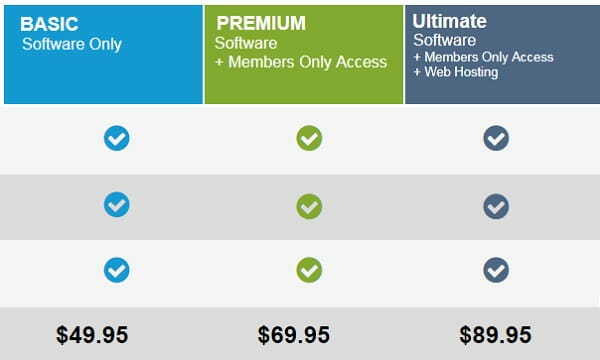 If you like the software, you can pick one of their one-time payment packages: Basic – $49.95 (software only); Premium – $69.95 (instant download+ membership); or Ultimate – $89.95 (instant download + CD + hosting). The first three options don’t include hosting. You’re free to publish your website to any web host. The third option includes one full year of web hosting service with BlackWire hosting. You’ll have the option to renew the hosting at the end of the year for $59.40 annually. The builder lacks modern themes. There’s no built-in blogging solution. You can certainly create and publish a decent website using 90 Second Website Builder. But it doesn’t seem like a good idea with so many more advanced, modern in-browser site builders out there. The builder’s latest blog post is dated Nov 30, 2016 and attempts to prove that responsive design isn’t that important.